The well known native dog and companion to the Australian Aboriginals is actually an import from India where specimins still exist and one of the clues that the native Aboriginals are also Indian migrants many from the Santal Hills area in India. 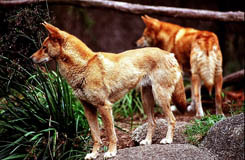 The dingo does not bark and mates easily with all imported domestic dogs. Such wild offspring have become notorios killers of stock.